I hope everyone had a great weekend. Mine was pretty eventful. On Saturday, I went shopping with my family at the outlet. Below are 3 dresses I tried on at BR store. I ended up didn't getting any of those dresses. What I like: All 3 dresses fit me quite well (all in 00P). Each has their own uniqueness. I went shopping this time purposely looking for more colorful clothes. My closet consists of 80% of grey/black/white color. I need to add more color to my closet. These are great choices for summer dresses! What I don't like: None of these dresses are on sale. Range from $79.00 to $99.00. I have no plan to spend that much $$ on a summer dress when I know I probably wear them no more than a dozen times. I'll wait until they go on sale (probably in the next few weeks). Even though I didn't find anything at BR that worth spending the money for, I did manage to score some fabulous finds at Ann Taylor Factory. They had tons of 00P and XXSP in store. I ended up paying less than $50.00 for both of the items below. The green top is a bit big on me but it made out of 100% cotton so I am sure it'll shrink after washed. The blazer on the other hand is awesome! I am loving it. Perfect for upcoming Fall. 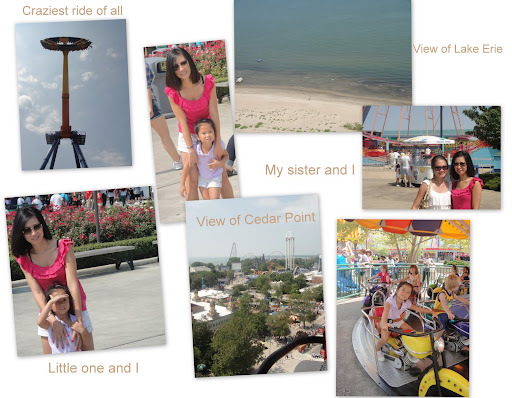 Today, we went to Cedar Point (the largest amusement park in Ohio). I wanted to wait until the weather cool down a bit before hitting the park but for some reasons, the weather is still in the 80's today. I am not a big fan of rides. I felt so bad for getting dizzy after getting off one of the "kiddie" rides. I am sure the hot temperature has something to do with it :) Everyone had a great time especially little one. It seems like I am always moving non-stop. I love my busy life and I can't imagine it any other way. After spending a whole day outside, I am whipped! It's time to hit the pillows. Good night, everyone! VERY CUTE finds! I like the 1st BR dress the best! Awww...looks like such a fun day!!!! I really like the first BR dress a lot. But agree, wait for a sale - I HATE paying full price for soemthing I have so much guilt!! The LOFT items are great. The green top looks like it has a bit of shine to it! Might be just the photos. I especially love the fit of that blazer. Great staple to have. Aww cute pics! I like how you arranged them. I'm with you ~ I wouldn't have spent the $79-99 on those dresses! Especially when clothing is constantly being marked down. The 2 tops that you did purchase fit you very nicely though, and you got a good deal! Kiddie rides sound great.. I'm terrified of the "big kid" rides!! I like the orange color dress..that one is my fave. BR stuff always goes on sale. The Loft blouse is cute -- very nice color. I'm like you and have so much white, grey & black. I do have colored items in my closet, but the basics are just so easy right? God I haven't been to an amusement park in so long. The little ones always have a good time there don't they? How fun - it seemed like you had a great time. Wow, the temperature there is in the 80's? That is still cooler than where I live. I actually think the first dress looks nice but I would not spend that much either. The main reason I don't shop at Banana Replubic is because most items are way overpriced for the materials they use in my opinion. The dresses look pretty on you! That green top is so gorgeous, I love that color. The necklace you wore with it is perfect. Re: amusement parks. I love them. I dragged my boyfriend with me to Six Flags like eight times this year. I'd love to visit Cedar Point in the future, it looks like so much fun! 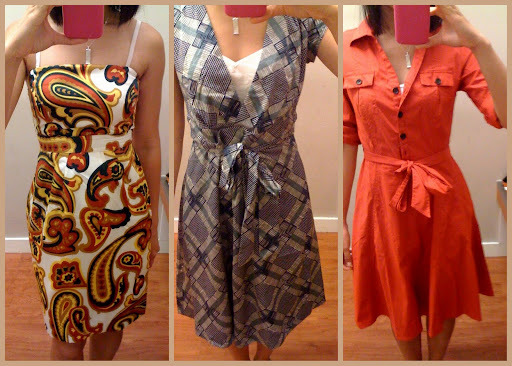 My fav is the orange shirtdress, which looks really good on you, but I wouldn't pay that much for a dress either! :P I don't know how you and ReallyPetite score such nice finds at your LOFTs, mine rarely has any decent sale items. Is the green top a petite item? I don't recall seeing that style on their website before. I really like the items you purchased! Such a lovely green..and you can never have enough blazers! That little girl is really cute! BR is a good store for really petite sizes. But it is expebsive there. Very cute dresses though. @Curls-and Pearls: I think the shiness was from the picture. This top wasn't shine in person. @Nelah: Yes, it is still hot where I live. I was hoping for mid 70's but it didn't happen. I love that jacket on you, so chic! I love your dresses! and the blazer. the dresses are okay, i mean for the price it's eeehhhh. haha and I'm not a big fan of rides either, most times I sit on the side and watch people's stuff while they go on the crazy rides. Lovely blazer that you're wearing btw! I didn't know Loft has a factory store. The emerald green top is beautiful. I love that color. So did you get the LOFT items @ LOFT factory store or just regular LOFT? I'm so jealous. what great finds! Love both the green shirt & jacket. Paired together would be nice too! Orange BR dress is also my fave. I think u really look good in tapered clothing! And u r a mother already? Wow, unbelievable! I wished by the time I'm a mother I'll b as slim as u! way super cute! love the third dress and love the little blazer. you are way to cute! loving your blog. lovee the orange/red dress on you! you should really get that one if it goes on sale!